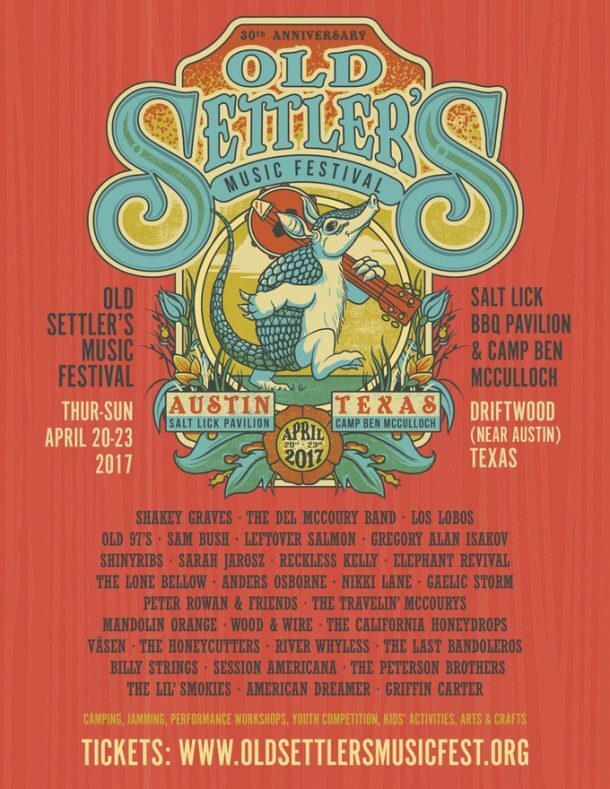 WHAT: Media is invited to preview, attend & cover the 30th annual Old Settler’s Music Festival, a unique four-day music experience featuring 30 outstanding roots, bluegrass and Americana acts performing on four stages in wildflower-laden central Texas April 20-23. Performers also include Peter Rowan & Friends, the Lone Bellow, the California Honeydrops, Gaelic Storm, the Travelin’ McCourys, Elephant Revival, Billy Strings, the Peterson Brothers, Session Americana, Lil’ Smokies, Wood & Wire, the Honeycutters, Väsen, River Whyless, Mandolin Orange, American Dreamer, the Last Bandoleros and Griffin Carter (schedule below). ABOUT: Old Settler’s has earned its reputation as one of the country’s finest roots music festivals by presenting a mix of respected veterans and exciting up-and-comers in a beautiful, relaxed setting. Campground jam sessions, engaging kids’ activities, a crafts market, specialty foods and brews, artist interactions and friendly patrons help deliver indelible memories that draw festivalgoers back year after year. Workshops with master performers and the Youth Talent Competition, where tomorrow’s headliners might gain early recognition and cash prizes, plus a festival slot, add to the allure of this gathering, one of the best entertainment bargains around. The nonprofit festival also gives back, via annual beneficiaries and a college scholarship program for music-related majors. FYI: Free apps for Apple and Android mobile devices, available via iTunes or Google Play, enhance the experience with customizable schedules, artist info and an interactive festival map. Old Settler’s also has posted special Spotify and YouTube playlists featuring festival artists.